This test depends on the presence of cytochrome oxidase in bacteria that will catalyze the transport of electrons between electron donors and redox dye. Tetramethyl-p-phenylene diamine dihydrochloride in the reagent is reduced to deep purple color. 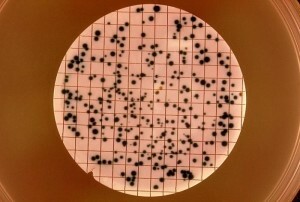 This test is used for the screening of Pseudomonas, Vibrio, Neisseria, Brucella and Pasteurella, which give positive test. Enterobacteriaceae are oxidase negative. Oxidase reagent is specially prepared as 10g/l or 1% solution of tetramethyl-p-phenylene diamine dihydrochloride. Place a piece of filter paper in petri dish and add 3 drops of freshly prepared oxidase reagent. Using a sterile glass rod, remove a colony of test organisms from a culture plate and smear it on the filter paper. Oxidase positive organisms give blue color within 5-10 seconds, and in oxidase negative organisms, color does not change.